Android 4.4.4 KitKat: How to Delete Messages, Automatically? 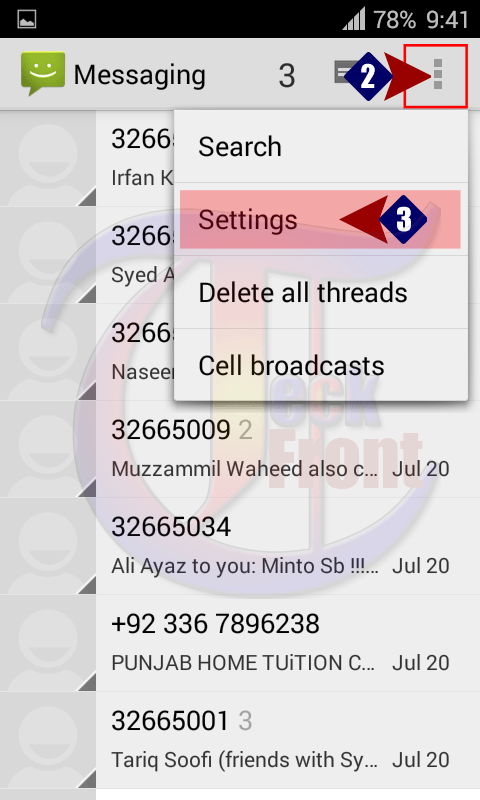 Android 4.4.4 KitKAt has a feature which, if set/activate, can delete the messages automatically which surpass the set limit. 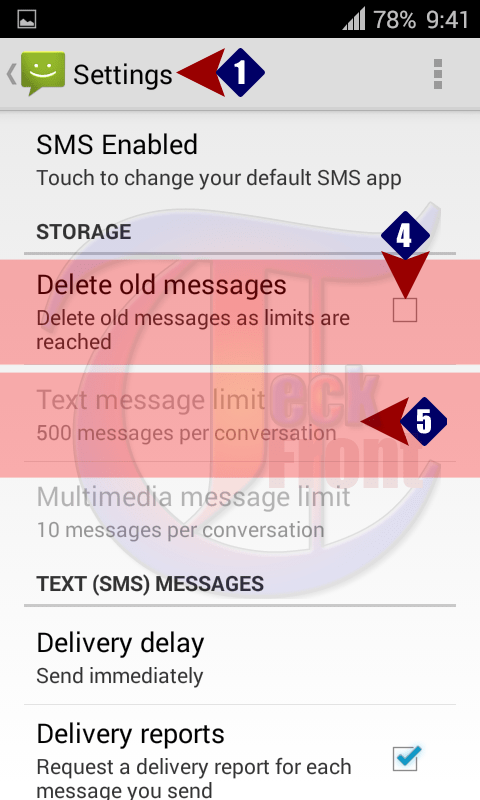 This feature helps to keep the received -messages database to a limit which otherwise may create problems for the users, such as, excessive usage of space, problems in locating the necessary and recent messages etc. To activate this feature, you need to follow some instructions. Command Line: Messaging App > Settings > Message Settings > STORAGE – Delete old messages > Text message limit. 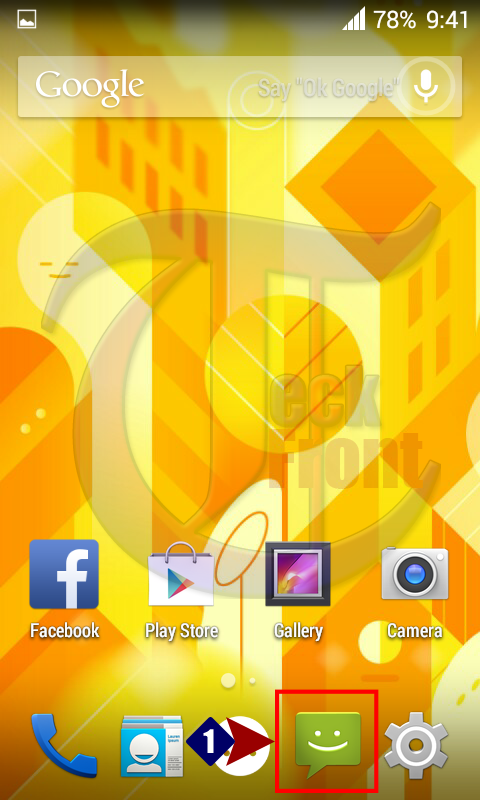 1: Tap the icon of ‘Messaging’ app on the Home screen of your Android 4.4.4 KitKat phone. 2: At the ‘Messaging app’ screen, tap the ‘Settings’ button, available at the top right corner of the messaging app screen. It will open up a popup menu. 3: In the popup menu, tap the ‘Settings’. 4: At the ‘Settings’ screen, see the ‘Delete old messages’ under the STORAGE, is unchecked and thus disabled. 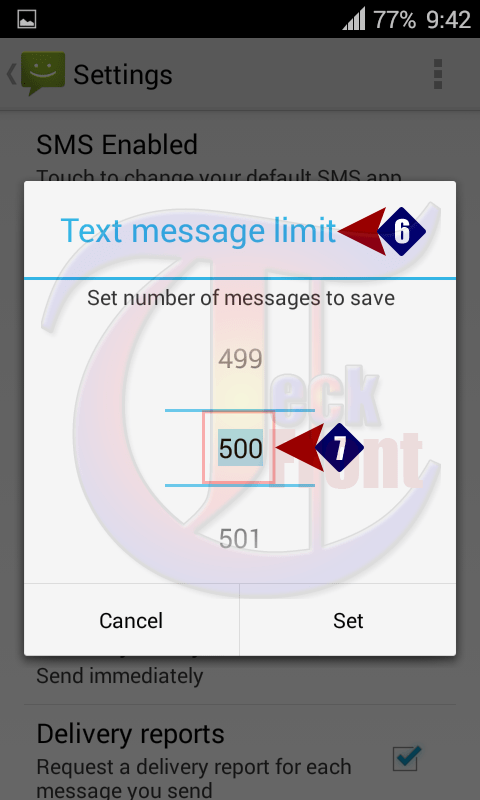 5: See also as the ‘Delete old messages’ is disabled, its relevant and subsequent part ‘Text message limit’ is also disabled and is not available to set the limit. Tap the ‘Delete old messages’ under the STORAGE to check and enable it. It will also enable the ‘Text message limit’. Now, tap the ‘Text message limit’. Here, see the ‘Text message limit’ is set at ‘500’ messages per conversation. 7: Now, tap ‘ the enabled ‘Text message limit’ and it will open up a prompt; named ‘Text message limit’. 7: At the ‘Text message limit’ prompt, tap the 500 messages and it will become available for the change with the help of a numeric keyboard. 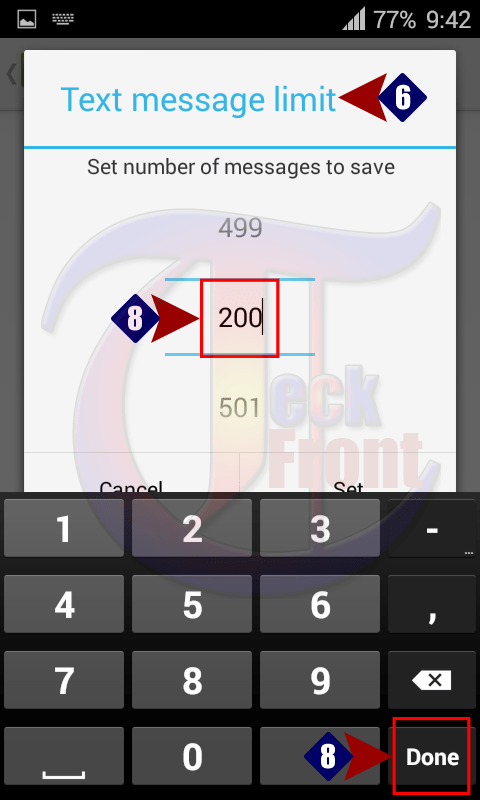 8: Set the limit of messages with the help of the numeric keyboard and tap ‘Done’ at the bottom right corner of the numeric keyboard. It will take you back to the previous prompt. 9: See the message limit has been set as desired by you. Here, Tap the ‘Set’ to save the limit. It will take you back to ‘Settings’ screen. 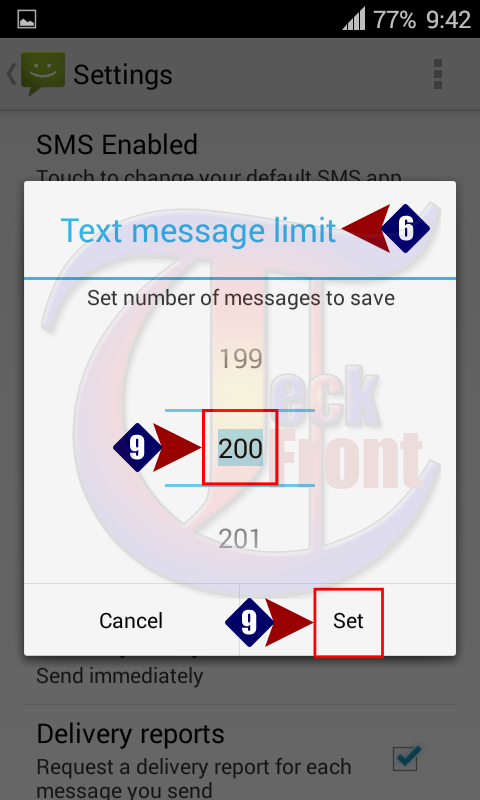 10: See at the ‘Settings’ screen, ‘Text message limit’ under the STORAGE is changed to ‘200 messages per conversation. Now, you Android 4.4.4 KitKat phone will delete all the messages which will surpass the limit set by you. Here, the limit set by me in this mobile is 200, i.e. if the number of messages in this Android 4.4.4 will increase and will cross the limit of 200 messages, the excessive messages will automatically be deleted. Newer Android 4.4.4 KitKat: How to Set Wake and Unlock When Message is Received? Older How to Set Sleep after 1 Minute of Inactivity / Screen Timeout in Android 4.4.4 KitKat?